Amundsen's Party at the South Pole. 062. AMUNDSEN'S PARTY AT THE SOUTH POLE. Issued by Brooke Bond Oxo Ltd. (1973). Card number 34 from a set of 50 entitled "Adventurers & Explorers". Size: 2.7" x 1.42". 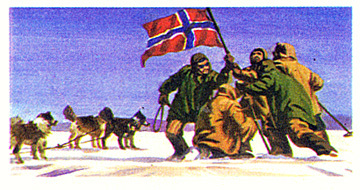 Recto: Men planting Norwegian flag at Pole; also 3 dogs.